Earlier today I was checking out app recommendations over at reddit‘s Android community. Someone suggested an app called Glympse, which allows users to share their location, Google Latitude-style, but falling back to SMS when the recipient doesn’t use Glympse. Cool, I thought. This intro shows a lovingly-built animated map that shows the user how the app works. Below are some nice stock images which occupy that kind of design filler space where I mentally think “great, some content I won’t ever read”. So far, so predictable. I was sold on the description before I saw the site, so where do I get the app? 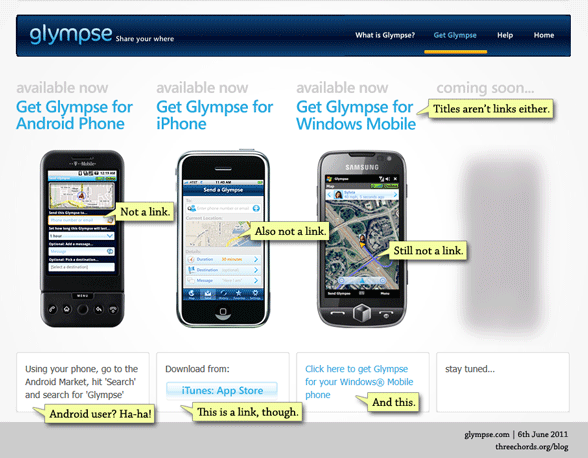 Um… the link in the header area marked “Get Glympse”. I was initially scanning the page for the word “download” (or even “app”) or some sort of Apple Store / Android Market icon, but got nothing. I’ve annotated the above screenshot, but you can see the page in question here. I saw the Android image, hovered my mouse, and was rewarded with… nothing. Tried the large bold heading link above. Nada. Saw the “iTunes App Store” link and assumed there’d be a link under the Android image. Nope. I have to search. 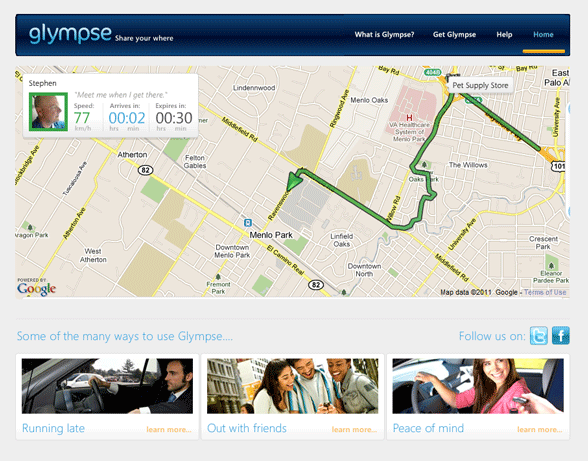 Dear Glympse: this is the internet, not a billboard. You can point me to exactly the right place to download your app. I don’t need to guess. The Android Market has a pretty fantastic website where I can click a large, prominent ‘INSTALL’ button to send the app to my phone, on demand. Take advantage of this. Link to that page. Your app has one. If I have to get my phone out, unlock it, load up the Market, search for your app and download it, I’m gone. Web users (not least me) are lazy. I was interested enough to click your site but when you make it this hard for me (and other phone platforms) to get to your app, you lose me. You have a button and a link for the iTunes / Windows Mobile apps – why aren’t the images links too? These criticisms may seem like minor complaints, but when you’re competing against short attention spans, rapid-fire browsing, and other apps, you need to make the path to downloading your app as fast as possible. Consider putting your download links on your front page, if not everywhere on your app’s site. One click. ← Portal 2: Missed opportunities?